Fig. 2 shows the system overview of DODDLE-OWL. DODDLE-OWL has the following six main modules: Ontology Selection Module, Input Module, Construction Module, Refinement Module, Visualization Module, and Translation Module. 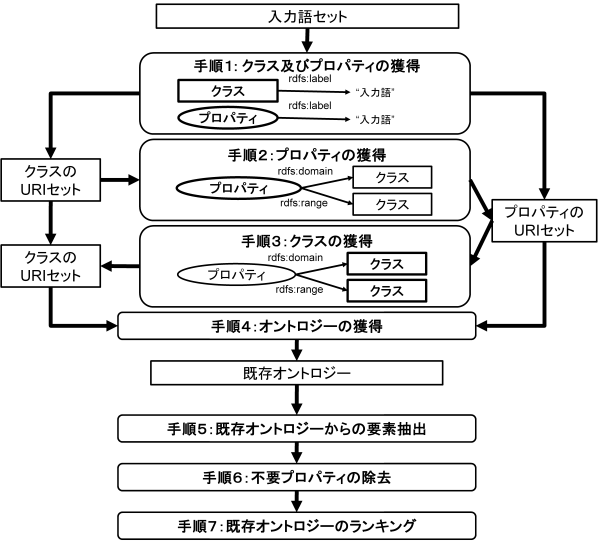 Hierarchy Construction Module and Hierarchy Refinement Module were included in DODDLE-I [Yamaguchi99] to support the user construct taxonomic relationships. Relationship Construction Module and Relationship Refinement Module, both added on to DODDLE-II [Kurematsu04] , support the construction of taxonomic and other rela- tionships. Ontology Selection Module, Input Module, Visualization Module, and Translation Module were additionally integrated in DODDLE-OWL to make possible an interactive domain ontology development environment. Here, we assume that there are one or more domain specific documents, and we also assume that the users can select important terms that are needed to construct a domain ontology. First, as input of DODDLE-OWL, the users select several concepts in Input Module. In Construction Module, DODDLE-OWL generates the basis of an ontology, an initial concept hierarchy and set of concept pairs, by referring to reference ontologies and documents. In Refinement Module, the initial ontology generated by Construction Module is refined by the users through interactive support by DODDLE-OWL. The ontology constructed by DODDLE-OWL can be exported with the representation of OWL. Finally, Visualization Module (MR3 [Morita06] ) is connected with DODDLE-OWL and works with an graphical editor. In the Ontology Selection Module, you select reference ontologies. The reference ontologies are used in the other modules in DODDLE-OWL. 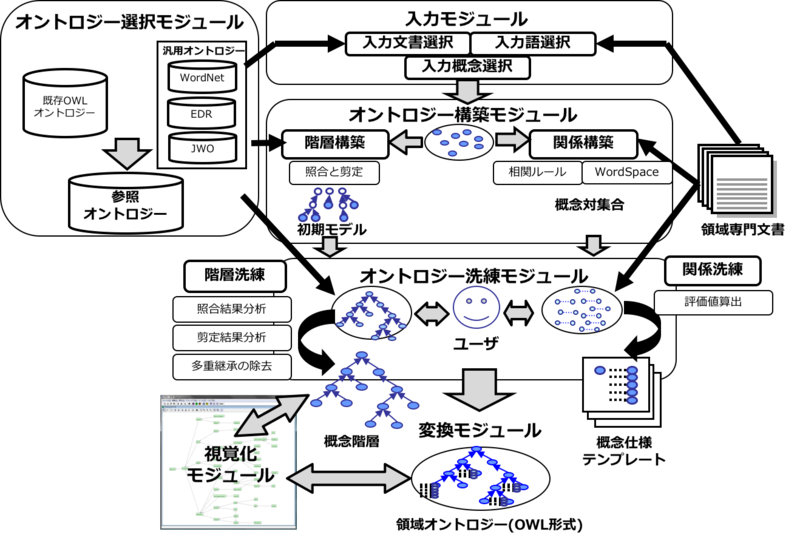 WordNet [Miller95], Japanese WordNet [Isahara08] ，EDR [Yokoi95] ，and Japanese Wikipedia Ontology (JWO) [Tamagawa10], which are general ontologies in English and Japanese, can be used as reference ontologies in DODDLE-OWL. Furthermore, DODDLE-OWL can use existing ontologies, which are described in OWL, as reference ontologies. In order to reuse existing domain ontologies, the user needs to find domain ontologies for the target domain on the web. OntoSelect [Buitelaar04] supports the search, selection, and browsing of ontologies on the web. Our proposed method for ranking existing ontologies is similar to the method for selecting appropriate ontology in [Buitelaar04] . Swoogle [Ding05] is an ontology search engine which indexes over 10,000 ontologies as of 2007. Swoogle can find classes and properties in ontologies, and also find implicit links and relations which are not defined in the ontologies. Swoogle also provides REST(Representational State Transfer) web-service interface for machine agents to avoid html-scraping. Swoogle uses OntoRank to rank ontologies and TermRank to rank classes and properties by their popularity as in the PageRank algorithm. From the viewpoint of domain ontology construction, not all popular ontologies are reusable. In order to find reusable ontologies appropriately, the mechanism to find existing ontologies for the target domain is necessary. In addition, since it is difficult to reuse the existing ontologies without modifying, it seems preferable to be able to collaborate with the domain ontology development environment and the ontology search engine. Swoogle provides 19 types of REST web-service interfaces (Swoogle Web Services). DODDLE-OWL acquires and ranks existing ontologies for a target domain using Swoogle by the following procedures depicted in Fig. 3. Acquiring the classes and properties which have the input terms (important terms for a domain from domain specific texts) as their URI’s local name or as the value of rdfs:label property. These classes and properties are named input concepts. Acquiring the properties which have the classes acquired from step 1 as their value of rdfs:domain or rdfs:range property. Acquiring the value of rdfs:domain and rdfs:range of the properties which are acquired from step 1 and 2. Acquiring the ontologies which define the classes and properties acquired from step 1 through 3. Referringtheontologiesacquiredfromstep4,removingthepropertieswhichare acquired from step 1 and 2, where the value of rdfs:domain or rdfs:range is neither the input concept nor the upper concept of the input concept. Gathering ontological elements from the acquired ontologies using templates described in SPARQL. Ranking the acquired ontologies mainly using the ratio of input concept in the ontology. The detail of step 5 is described in Extracting ontological elements from existing ontologies and the details of step 7 is described in ranking-existing-ontologies. In order to reuse existing ontologies for domain ontology construction, it is necessary to extract reusable elements from existing ontologies. DODDLE-OWL supports the construction of taxonomic and other relationships in the domain ontology. The elements constructing taxonomic and other relationships are concepts (classes and properties), labels of concepts, descriptions of concepts, super-subrelations, and other relations. Concept is absolutely essential for the domain ontology construction. Labels of concepts are necessary to find concepts related to input terms. Descriptions of concepts are necessary for word sense disambiguation. Super-subrelations are necessary to construct taxonomic relationships. Other relations include the definitions of the properties and their rdfs:domain and rdfs:range. Other relations are necessary to construct other relationships. Ontology languages (e.g. RDFS, DAML, and OWL) provide the vocabularies to define the above elements of ontology. In Swoogle, the user can search ontologies based on the vocabularies provided by RDFS, DAML, and OWL. Most of the existing ontologies are described in basic vocabularies of RDFS, DAML, and OWL. However, some general ontologies and thesauruses are described based on other schemes. WordNet RDF/OWL provides a standard conversion of WordNet for direct use by Semantic Web application developers. The WordNet RDF/OWL schema is different from the OWL basic vocabularies. SKOS (Simple Knowledge Organisation System) [Miles05] provides a model for expressing the basic structure and the content of concept schemes. Some thesauruses are converted to SKOS. SKOS is also different from the OWL basic vocabularies. Fig. 4 shows the difference of the labels of concepts among OWL basic vocabulary, SKOS, and the WordNet RDF/OWL scheme. In Fig. 4, we regard a synset in WordNet as a concept. From the viewpoint of domain ontology construction reusing existing ontologies in various schemes, including thesauruses, we use five types of templates for extracting the elements of ontology described in SPARQL query language for RDF [hommeaux08] . The five types of templates each extract one of the following elements: Classes, properties, labels and descriptions, super-subrelations, and other relations. DODDLE-OWL uses OntoRank, TermRank, and the ratio of input concept in the ontology as the ranking measures for the extracted ontologies. OntoRank is the ranking measure for ontologies proposed in [Ding05], and TermRank is the ranking measure for classes and properties also proposed in [Ding05]. We assume that the more the ontology includes input concepts, the more it relates to the target domain. If two ontologies include the same number of input concepts, the user can select the more popular ontology according to their OntoRank. 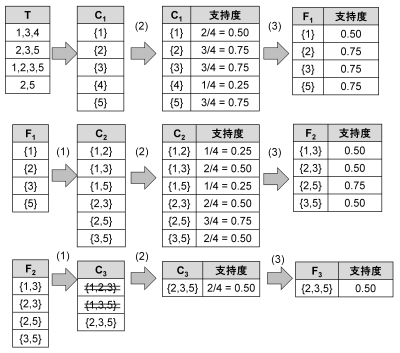 When there are multiple candidates for the input concept due to the ambiguity of the input term, the user can select the more popular concept according to their TermRank. In the Input Module, the users select input concepts which are significant concepts in a domain. Input Module consists of the following three sub-modules: Input Document Selection Module, Input Term Selection Module, and Input Concept Selection Module. Fig. 5 shows the flow of the Input Module. The detail of each sub module is described below. 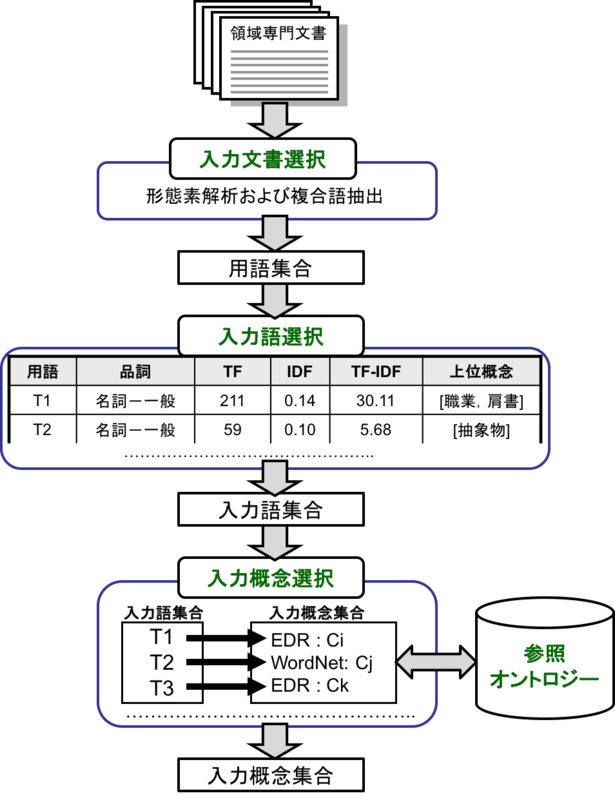 First, in the Input Document Selection Module, the users select domain specific documents described in English or Japanese. At this step, the users can select part of speech (POS) for extraction of words from the documents. The Input Document Selection Module automatically distinguishes one sentence from another referring to the period punctuation. However, when the input document consists of sentences with no period punctuation marks, the Input Document Selection Module cannot distinguish where to punctuate the sentence. These input documents cause the decrease in the accuracy of other relationships constructed by using association rule learner in the Relationship Construction Module. Considering such a case, the users can edit manually the punctuation of one sentence in the documents using the Input Document Selection Module. Second, the Input Term Selection Module shows a list of extracted terms including compound words, POS, Term Frequency (TF), Inverse Document Frequency (IDF), TF-IDF, and upper concepts of the terms in the documents. Here, the uppser concepts are in the reference ontologies and the users can set them in an upper concept list file. For example, if EDR is set as a reference ontology and the users set the “concrete object” concept as one of the upper concepts, input terms which match labels of sub concepts of the “concrete object” concept are shown with the concept. Domain specific documents contain many significant compound words. Therefore, accurate extraction of compound words is necessary to construct domain ontologies. At this step, while considering POS, TF, and so on, the user selects input terms which are significant terms for the domain. For certain domains, important terms do not occur in the documents. In such a case, Input Term Selection Module has a function allowing the manual addition of important terms as input terms by the user. In order to prevent the leakage of the selection of input terms from the documents, Input Term Selection Module maintains the relationships between the extracted terms and the place where the terms appear in the documents. Finally, in the Input Concept Selection Module, the user identifies the word sense of input terms to map those terms to the concepts in the reference ontologies selected with the Ontology Selection Module. A particular single term may have many word senses. Therefore, there may be many concepts that correspond to the word. Input Concept Selection Module shows the input terms and the concepts that correspond to the input terms. While considering the domain, the users select the most appropriate concept for the term from the list of concepts. In order to decrease the cost for input concepts selection, the Input Concept Selection Module has a function enabling automatic word disambiguation (input concept selection). This function shows the list of concepts, which is ordered by some criteria, corresponding to the selected input term. Input Concept Selection Module uses perfectly matching and partially matching to disambiguate input terms. Though, labels of most concepts do not contain compound words. Therefore, it is difficult to select the appropriate concept for compound words. To deal with this, partially matching is used to disambiguate most of the compound words of the input terms. Perfectly matching and partially matching mean an input term perfectly or partially corresponds to labels of a concept. The priority of perfectly matching is higher than that of partially matching. If an input term does not correspond perfectly to any labels of concepts in the reference ontologies, the Input Concept Selection Module analyzes the morphemes of the input term. The input term can be considered to be a list of the morphemes. Input Concept Selection Module tries to correspond the sub lists (example shown below) to the concepts of the reference ontologies. Of the matched concepts corresponding to the sub lists, the longest concept is selected as the concept of the input term, and the input term becomes the sub concept of the concept. For example, the input term rocket delivery system does not perfectly correspond to the labels of concepts in the reference ontologies. 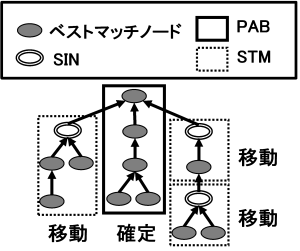 The Input Concept Selection Module analyzes morphemes of rocket delivery system. Rocket delivery system is resolved to rocket, delivery, and system. The sub lists for this input term becomes delivery system and system. First, Input Concept Selection Module disambiguates delivery system. Then, the Input Concept Selection Module disambiguates system. In this example, delivery system does not correspond to the labels of concepts in the reference ontologies. On the other hand, system corresponds to the labels of concepts in the reference ontologies. Consequently, in order to disambiguate rocket delivery system, Input Concept Selection Module shows the concepts which have system as their label. Input terms which do not correspond to the labels of concepts in the reference ontologies are undefined terms. The input terms are also undefined terms if the concept exists but there are no appropriate concepts in the reference ontologies. The user defines the undefined terms manually in the Refinement Module. The Construction Module automatically generates the basis of an ontology, an initial concept hierarchy and set of concept pairs, by referring to reference ontologies and documents. An initial concept hierarchy is constructed as taxonomic relationships. Set of concept pairs are extracted by using co-occurrency based statistic methods. These pairs are considered to be closely related and that they will be used as candidates to refine and add other relations. The users identify some relationships between concepts in the pairs. The Construction Module consists of the Hierarchy Construction and the Relationship Construction Module. The detail of each module is described below. In order to visually support the refinement of the semi-automatically constructed domain ontology, DODDLE-OWL is integrated with the Visualization Module. DODDLE-OWL uses MR3 : Meta-Model Management based on RDFs Revision Reflection [Morita06] as the Visualization Module. MR3 is a graphical RDF and RDFS editor for managing relationships between RDF and RDFS descriptions. DODDLE-OWL can interchange an OWL ontology with ¥mrcube using a plug-in function of MR3 . Visualization Module has two main roles for supporting domain ontology construction. One is the visualization function for concept drift management in the Refinement Module. Visualization Module displays the initial concept hierarchy generated in the Construction Module. Then, the user can visually refine candidates of concept drifts which are suggested by the Refinement Module. The other role is the externalization of the domain ontology. The externalization of the domain ontology means visualizing the whole taxonomic relationships and other relationships in the domain ontology. Taxonomic relationships and other relationships are constructed separately in the Hierarchy Construction Module and the Relationship Construction Module. By the externalization of the domain ontology, the user can refine the domain ontology while regarding the balance of the taxonomic relationships and other relationships. Translation Module exports the taxonomic relationships and other relationships described in OWL. Taxonomic relationships are defined using owl:Class class rdfs:subClassOf property. Other relationships are defined using owl:ObjectProperty class, rdfs:domain property, and rdfs:range property. Fig. 14 shows an example of exporting taxonomic relationships and other relationships in OWL. The upper part of Fig. 14 shows that goods class is a subclass of artifact class. The lower part of Fig. 14 shows that attribute relationships is defined between an individual of goods class and an individual of quality class. owl is a prefix of http://www.w3.org/2002/07/owl#. rdfs is a prefix of http://www.w3.org/2000/01/rdf-schema#.